It was felt by BMC management that a more prestigious car was needed to compete with the Jaguar MK X and Rover P5 3 Litre. A contract with Rolls Royce who was debating whether they should make a smaller car than the Silver Cloud/S-type became preferable. A venture was undertaken to put the Rolls Royce FB60 engine into a BMC Farina bodyshell. The engines origins dated back to the 1940s and were used in military vehicles. The rear end was restyled with a horizontal light arrangement and the roofline was raised to give more headroom at the rear. Automatic transmission and power steering were standard. The car was priced at just under £2,000, the tax-break limit on company cars. 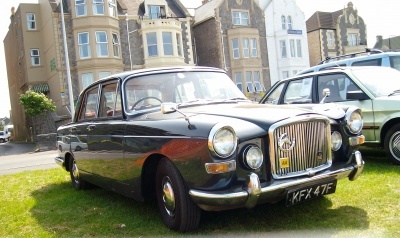 The car did not live up to pre-production publicity and it did not sell well and with the BMC merger with Jaguar in 1966 the Vanden Plas 4 litre R was doomed. Layout: Pressed steel unit construction body-chassis structure, 5-seater 4 door saloon with front mounted engine. Engine and Transmission: Rolls Royce FB60 6- cylinder engine, iov, in-line. 3,909cc, 95.25x91.44mm, 175bhp at 4,800rpm; 218lbs ft at 3,000rpm. Borg-Warner 3-speed automatic transmission; live (beam) rear axle with hypoid-bevel final drive. Chassis: Independent front suspension, coil springs, wishbones and anti-roll bar. Rear suspension by half elliptic leaf springs. Front discs and rear drum brakes. 7.50x13 tyres. Cam type steering with power assistance. Dimensions: Wheelbase 9ft 2in; front track 4ft 6.9in; rear track 4ft 5.25in; length 15ft 8in; width 5ft 8.5in; height 4ft 11in. Unladen weight (approx.) 3,530lbs. Performance: Maximum speed 106mph; 0-60 12.7sec; fuel consumption 15mpg.